When Elizabeth first came up with the idea for the Consumer Financial Protection Bureau, a lot of people in Washington said it would never happen. The big banks were making enormous profits off the status quo — little oversight, sparse accountability, and cozy regulators in Washington. They would assemble an army of lobbyists to stop real reform, and everyone knew it. 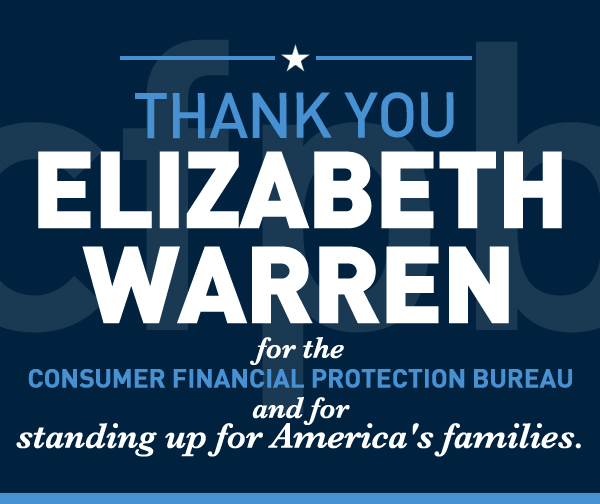 She stood up to the bankers on Wall Street and the lobbyists in Washington — and she won a strong new watchdog to protect consumers and stand up to the big banks for all of us. This week is the one-year anniversary of the Consumer Financial Protection Bureau opening its doors — and we’ve started an online card thanking her for making it possible. Will you sign the card with me? From the beginning, the purpose of the new agency has been to hold big banks accountable and to rein in the tricks and traps too often buried in the fine print of mortgages, credit cards, student loans and other financial products. Just yesterday, the CFPB delivered its first enforcement action against the financial industry — forcing Capital One to refund $140 million to its customers for deceptive credit card practices. Launching the Know Before You Owe Project to make prices and risks clear up front. The project includes a new student financial aid shopping sheet, a shorter two-page credit card agreement, and a single, simpler mortgage disclosure form. Collecting consumer complaints on credit cards, mortgages, bank accounts, and private student loans. The Consumer Response Center has helped thousands of people to resolve their complaints about financial products and services. Protecting older Americans, servicemembers, students and their families by helping them to navigate unique financial challenges with education and engagement about their financial choices. Elizabeth’s original thinking was critical, but it was her fierce determination and fearlessness that made it possible. She wore out the soles of her shoes meeting with Members of Congress and Obama Administration officials. She met again and again with labor unions, consumer groups, civil rights organizations, small business organizations, and anyone who would listen to rally support. There was never a task she wouldn’t take on to make this consumer agency real.